Enhanced compression wavelet (ECW) is a high-per­for­mance com­pressed file format designed specifi­cally for geo­spatial imagery. When compared to other image com­pression for­mats, Intergraph (ERDAS) patented ECW tech­nology provides the industry’s fastest de­com­pression and com­pression rates possible. Re­markably, this is done with­out placing a heavy load on computer memory and pro­cessors, while also main­taining high com­pression ratios and visually loss­less image quality. ECW has become the de facto industry standard for rapidly handling large geospatial imagery. ECW can compress imagery to 5-10 % of the original size, while remaining visually lossless. Reduce images to manageable size. 64 bit file support handles large images. 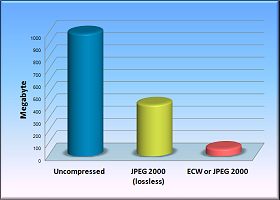 Compress images with almost unlimited file size. Widely used by GIS, CAD, and imaging applications. Easily exchange images. Fast viewing at any resolution for any region. Fast zooming and panning over large images. Low memory footprint. Applications run faster; inexpensive hardware is needed. Geolocation data preserved as embedded metadata (ISO’s standard GML for JPEG 2000). Correctly locate images. Opacity channel support. Mask out background and null data areas. Multiresolution detail built into ECW. Eliminates the need for tile caches, pyramids and overviews.